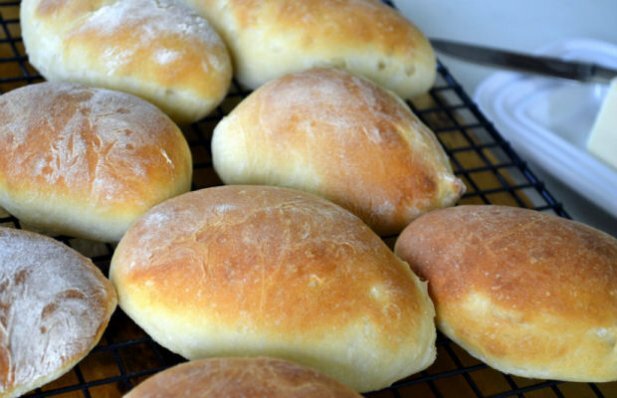 How to make Portuguese rolls. Bake at 450 degrees F in a preheated oven. Use the top rack, a must, and place a pan of water on the bottom rack, not a must. These buns were at one time cooked in brick ovens. The added water help produce a similar product as one baked in a brick oven, crusty. Dissolve the sugar in 1/2 cup of the lukewarm water. Sprinkle the yeast into this mixture and stir slightly. Set aside for 10 minutes. Measure the flour into a large bowl. Add the slightly softened butter. Mixing the butter into the flour is not necessary at this point. Once kneading takes place the butter will be well incorporated. Add the yeast mixture to the flour and stir. I use a hand held bread hook. A fork can be used. Gradually add the remainder of the water, 1 and 1/2 cups, and stir. The dough will become sticky. Turn this out onto a floured surface for kneading. Have extra flour close by for your hands and the surface. Knead the dough for 10 minutes. Add bits of flour to hands and board as needed to keep the dough from sticking. Add the salt at this time or add after the first rise. After the kneading form the dough in a smooth ball. Grease a bowl large enough for the dough to double in size. Grease hands with the shortening and rub gently over the dough surface. Place dough into the bowl and cover with a dish towel. Place in a draft free area. If you kitchen is cool like mine in the winter place the covered bowl inside the oven with the interior light on only … no additional heat. Let rise for 1 and 1/2 hours or until double in size. The dough has doubled and now has been punched down. Add salt now if you haven’t. Gently knead to incorporate salt if needed. Form the dough into a round flat disk and cut like a pie into 16 pieces. Roll each of the 16 pieces into a ball and then flatten to approximately 3 inches in diameter. For each pop form a 3 inch diameter disk. Use the side of your hand to make an impression down the center. Fold the pop in half and pinch the edges together. You can have the seam along the side as I do here or the seam can be right down the center of the top. Pinch the ends to a slight point. Place these formed pops about 2 inches apart on a greased cookie sheet. Cover and let rise 50 minutes in a draft free area. I used parchment paper. At 450 degrees F the parchment paper could burn, and is not recommended. These are ready to bake. Bake for 15 minutes or until golden brown. The top rack is recommended to avoid burning the bottom of the pop. Spread with butter and dig in!